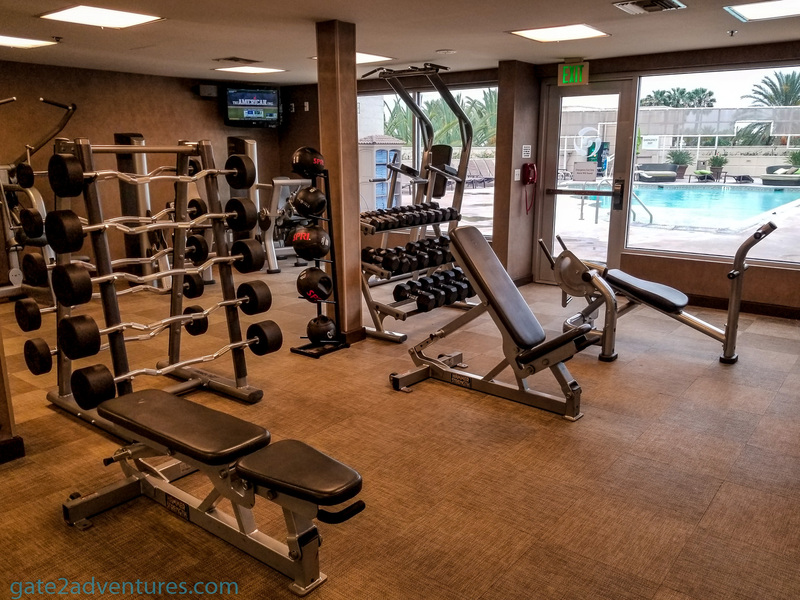 As I am working out in Corona, CA during the week, I am always looking for a weekend getaway if I am not working weekends. The last view times I spent the weekend at the Hyatt Regency Long Beach, which is a great hotel to stay at, especially if you have business in this area. 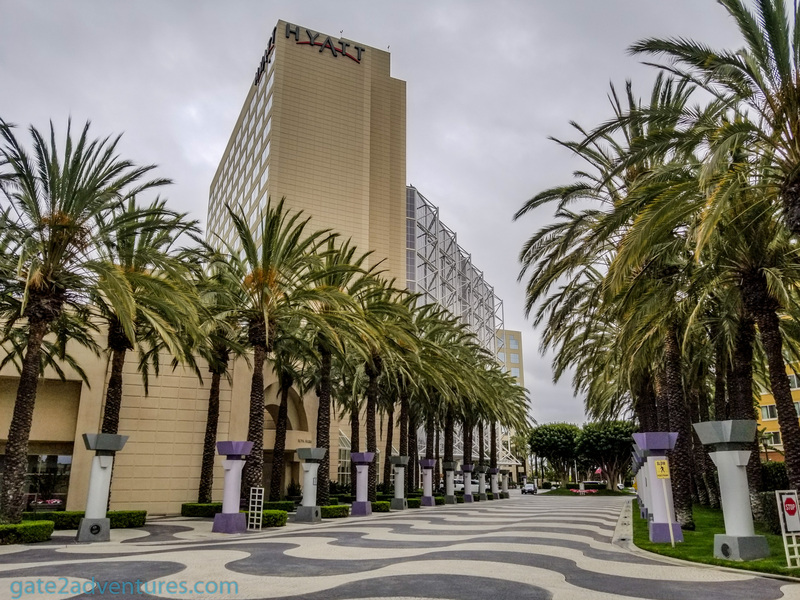 For this specific weekend I tried to go to the Hyatt Regency Long Beach again, but first, it was sold out when I checked Friday morning and later on that day rooms were available but for an insanely high price of over $300. 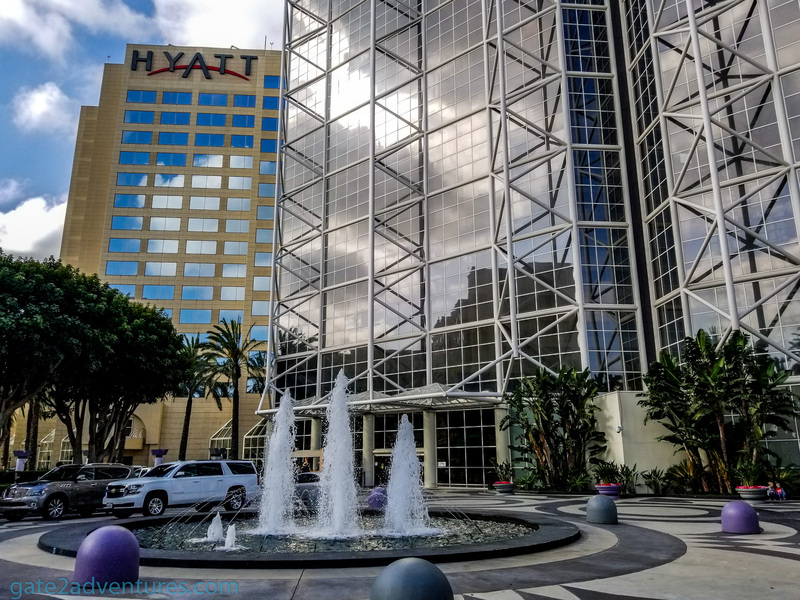 After some research, I decided to book the Hyatt Regency Orange County. It had two big advantages for me. 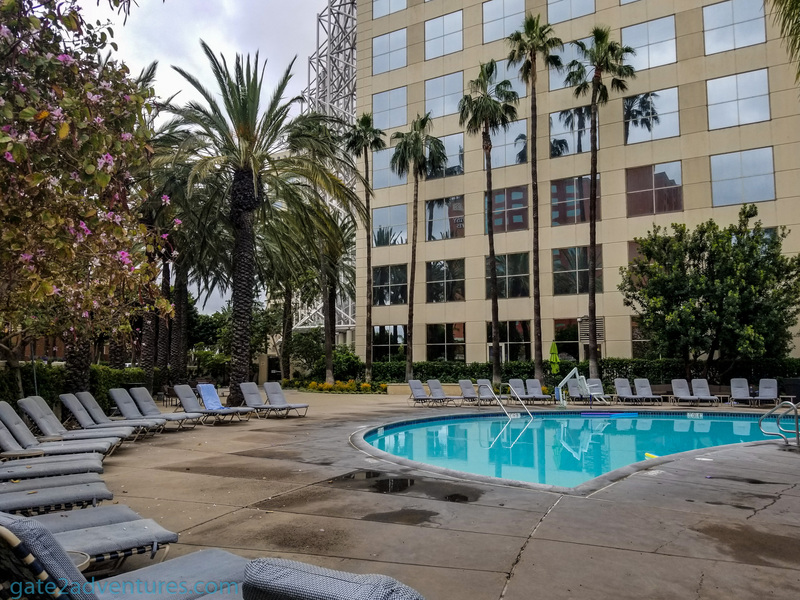 First, the price was very cheap, room rate was $95 and second, it was close to the John Wayne Airport in Orange County, where I would fly out on Monday. The drive to the hotel took a while, as I got stuck in the usual LA traffic. Once I made the final turn into the hotel driveway, I was impressed. The driveway leading up to the hotel is amazing. A palm tree alley with painted cobblestones to form waves. 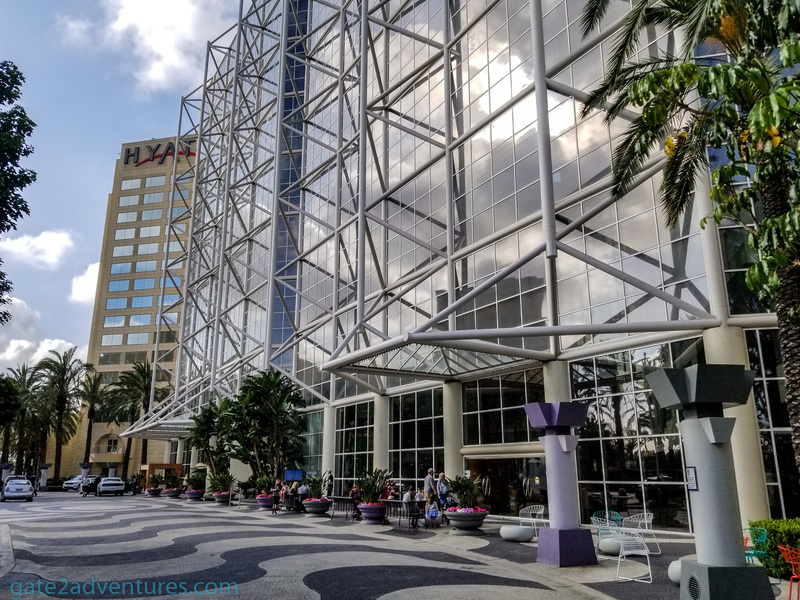 You can also see the huge glass front of the hotel which sits in between the two towers. The driveway gets divided in front of the hotel to one-way streets and with trees and a fountain in the middle. I turned around at the end of the driveway and parked right in front of the hotel. A valet came up to me and he let me park my car there to check-in and unload. He offered assistance as well with bags if I needed any. The only terms for leaving the car there was handing over the keys in case they have to move it. As this was my first time here at the hotel, I asked the valley for directions to the check-in counter. The check-in counters are on the other side of the outside of which I parked in front of. There are two entrance doors to the hotel lobby. One near the valet booth and one on the other end of the hotel. The check-in counter is right in between. I walked in and lined up at the “World Of Hyatt” priority lane. The agent was assisting another guest and I was second in line. After only a few seconds I got called up and was able to check in. 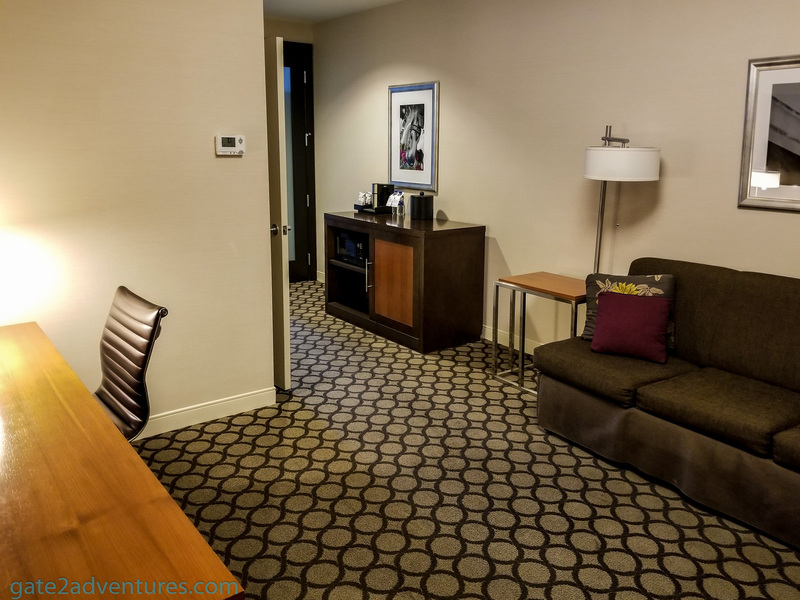 One of the best perks as Globalist is the complimentary upgrades you receive and Hyatt is pretty good in upgrading loyal members. Without even asking I got upgraded right away to a 1 Bedroom King Suite. I decided to go with self-parking instead of valet, which is a lot cheaper. The agent explained to me the details and amenities of the hotel and gave me a flyer with all the important information. 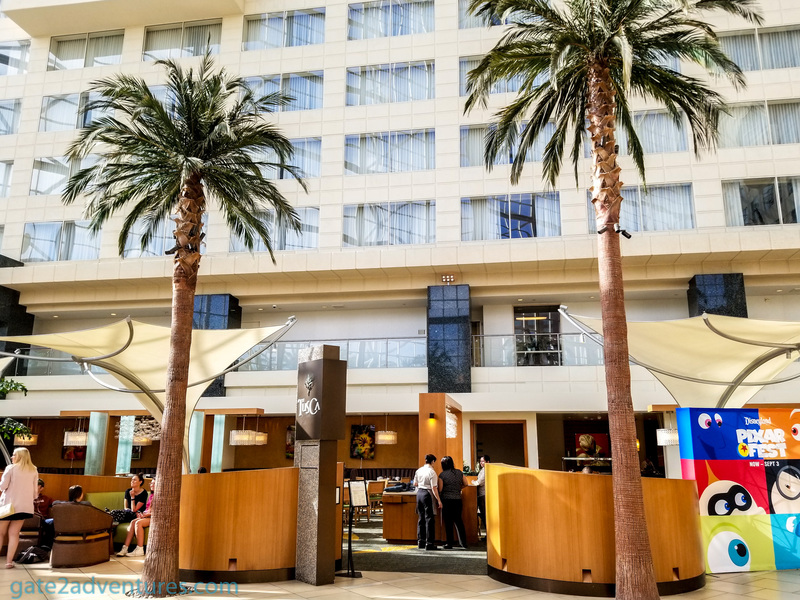 Once you walk into the lobby you can already see that this hotel caters a lot to families and people visiting Disneyland just a few blocks down the street from here. You can buy your Disney-Tickets here, and they have a shuttle bus going back and forth between the hotel and Disneyland. 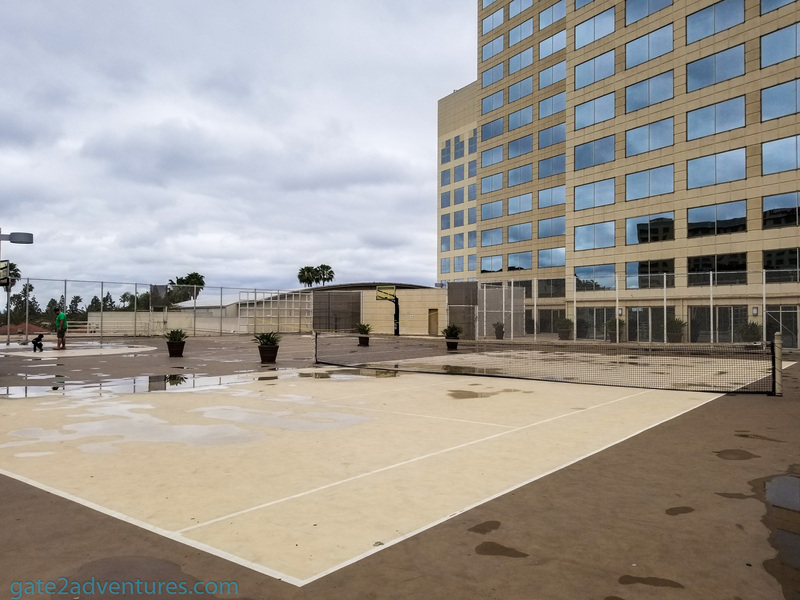 I grabbed my bags and headed to the elevator for the North Tower, dropped my bags and came back to park my car in the self-parking lot behind the hotel. To access the parking lot, you will sue your room key. Unfortunately, the readers at the gate hate some issues and I had to try a few times until the gate opened for me. From here I took my last bag out of the car and used the back entrance to get to the elevator and back to my room. The elevators are super slow here. My room was on the 8th floor of the North tower and I decided a few times, when I was without bags, to rather use the stairs than the elevator. If you get unlucky, they have a bus with people coming in and the waiting time will get so high, you can walk the stairs, even when you walk them slowly, you will still be faster. At the South Tower, they let you use the service elevator as well during the day. This one is usually only used by housekeeping and staff. They are on their way to modernize the elevator systems right now. The North Tower is supposed to be finished in July 2018 and South Tower is estimated to be fully operational around November 2018. They really need this upgrade. My suite was facing the front side of the hotel towards the glass front. My windows of the bedroom weren’t actually outside of the hotel it was within the huge conservatory, as I would call it. 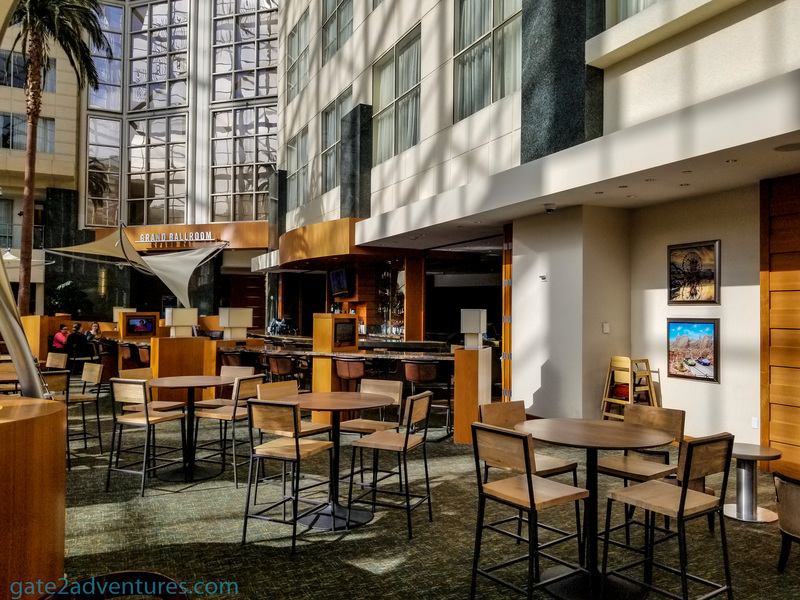 I had a few of the lobby area and thanks to the gigantic glass front also to the outside of the hotel. This is something different from most hotels. 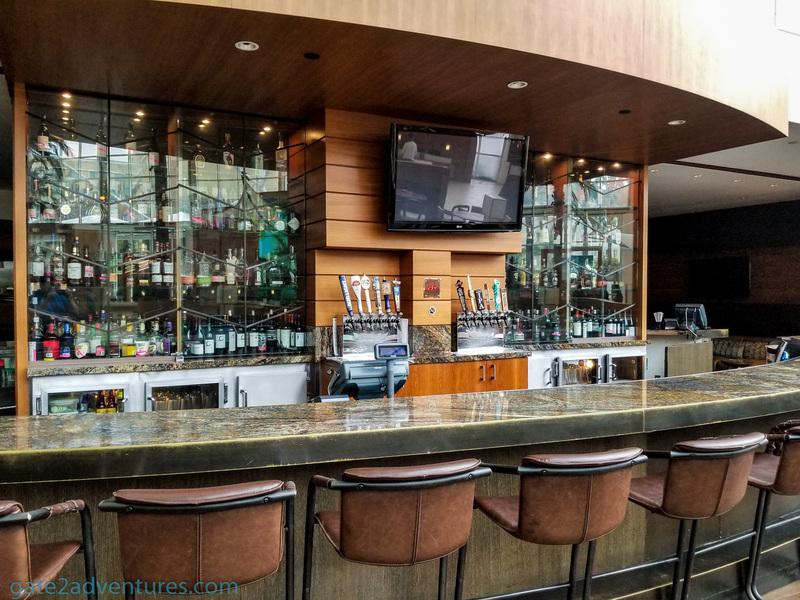 However, it has one drawback, during night times you can hear the noise from the people in the lobby and restaurants, which are all open spaces within the conservatory. Around 11 p.m. it was pretty quiet anyway, but if you have issues with that, you might want to go to a different room. It also depends, which guests you have. Lots of families with young kids, oh boy, it could get a bit louder than usual than. 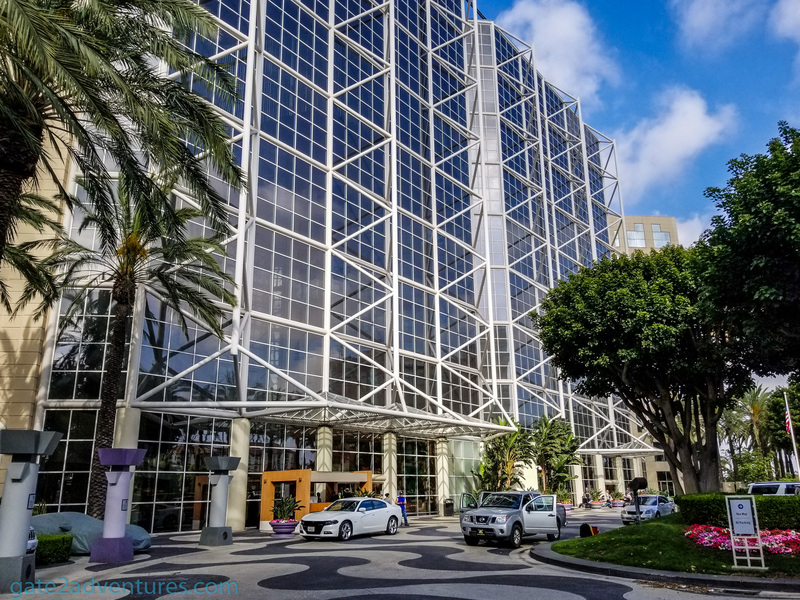 This hotel is frequented by people visiting Disneyland. Once you enter the room you will see the huge and spacious living room. 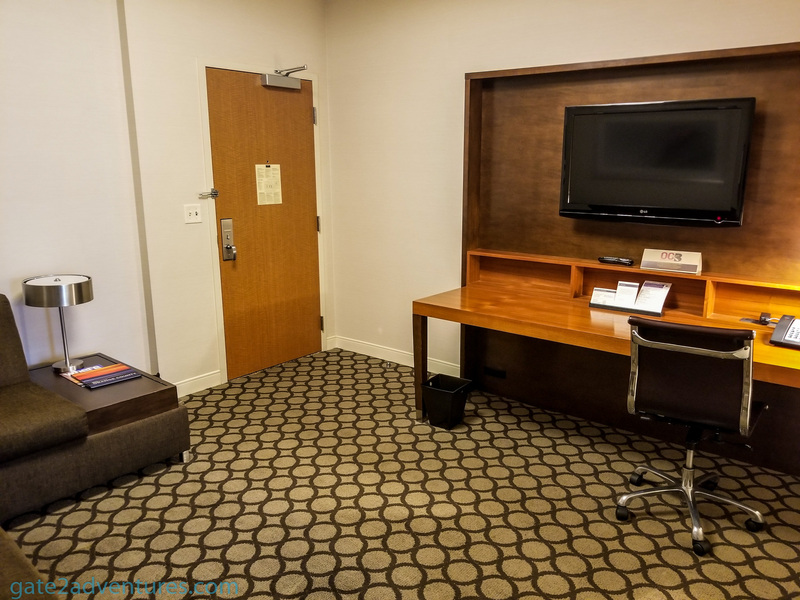 On the left is an oversized workstation table to set up your laptop and other gadgets. There was a wall panel with connections to hook up to the TV which is mounted directly above the workstation. Adjacent to the workstation is a corner sofa which can be transformed into a bed. There is plenty of space in between these two which is great for kids to play. Along the wall, next to the sofa is a closet with the refrigerator and microwave and on top of it is the coffee/tea maker. The only thing about the living area is that there are no windows and its pretty dark during the day. Of course, there are lights but I prefer natural light during the day. You probably won’t spend a lot of time here anyway and will be out and about. Adjacent to the closet is the bathroom with a shower tub. This property already transited to the bigger shower gel dispensers in the shower itself rather than having small single bottles. The bottles were locked in place, so nobody can open it, to put something else in there but you can, of course, use the pump head to dispense the gel. I like them a lot, even tho there is a big discussion right now in the traveling community about whats more hygienic. The bathroom is big enough to be comfortable and without loosing to much space of the suite itself. Last but not least the bedroom, which is separated from the rest of the room with a double-door. 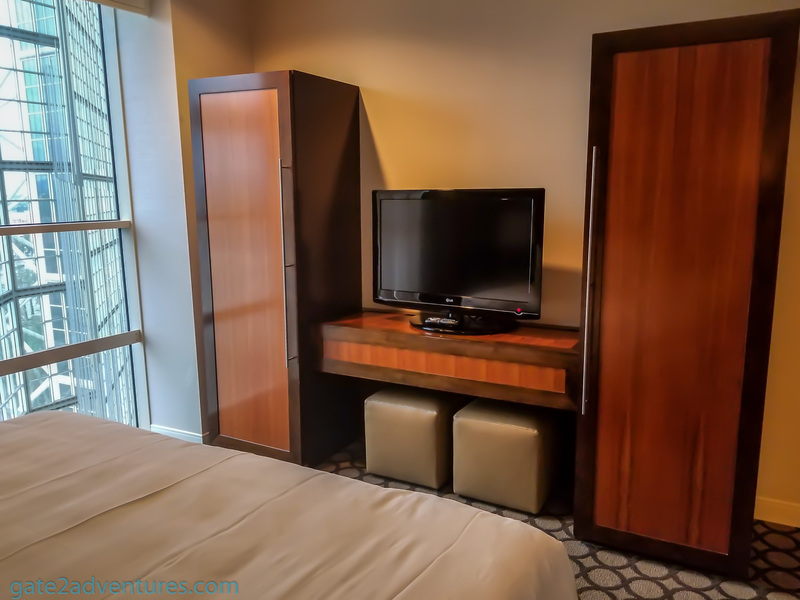 The King Bed is in the middle of the room on the left wall and across from it is another closet with two towers and a TV stand in the middle with a flatscreen TV. The left tower had additional sheets, iron and ironing board and paperwork for dry cleaning, besides the stow area for clothing, while in the right one is a safe and lots of extra space to store your clothes. 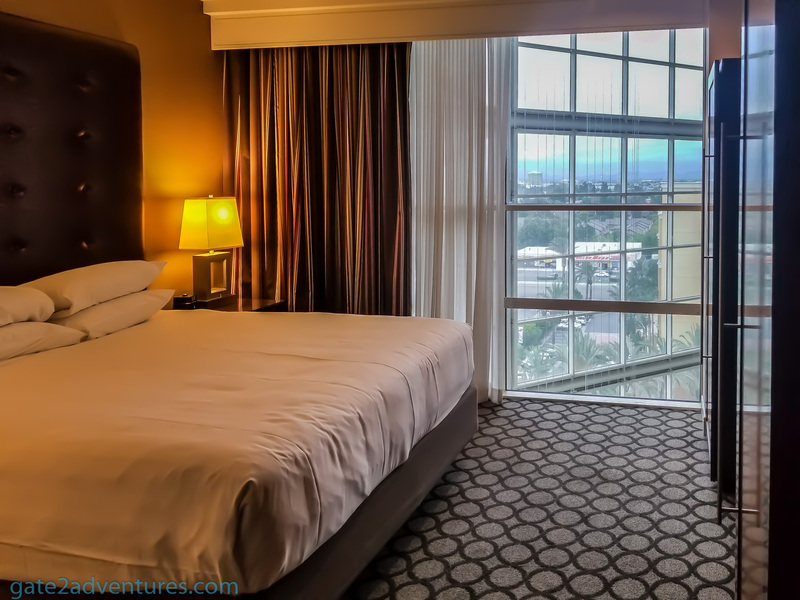 The floor to ceiling windows takes up almost the whole outside “wall” of the room. You can’t open any of the windows. There is a nightstand on either side of the bed with lights and one had an alarm clock/music player. 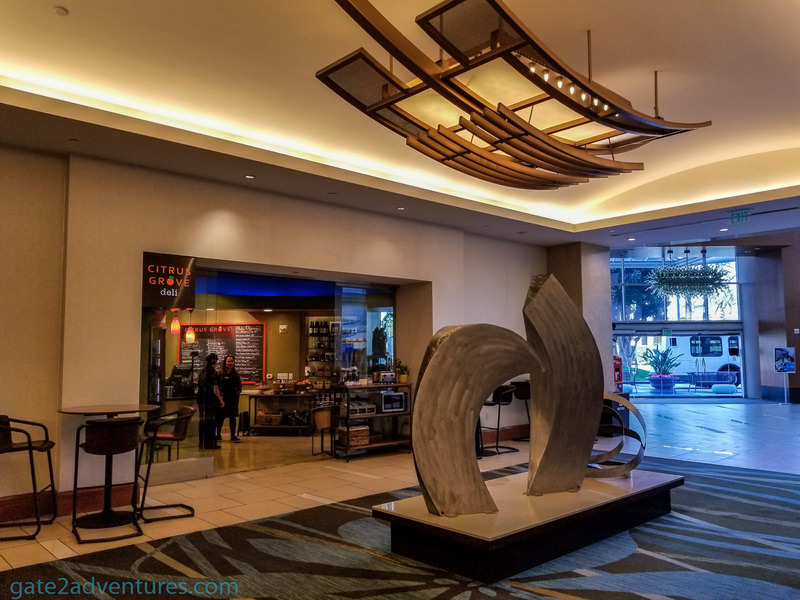 The Hyatt Regency Orange County has quite a lot to offer for its guests. The main example is probably the two heated outdoor pools. One on the ground floor outside of the hotel. 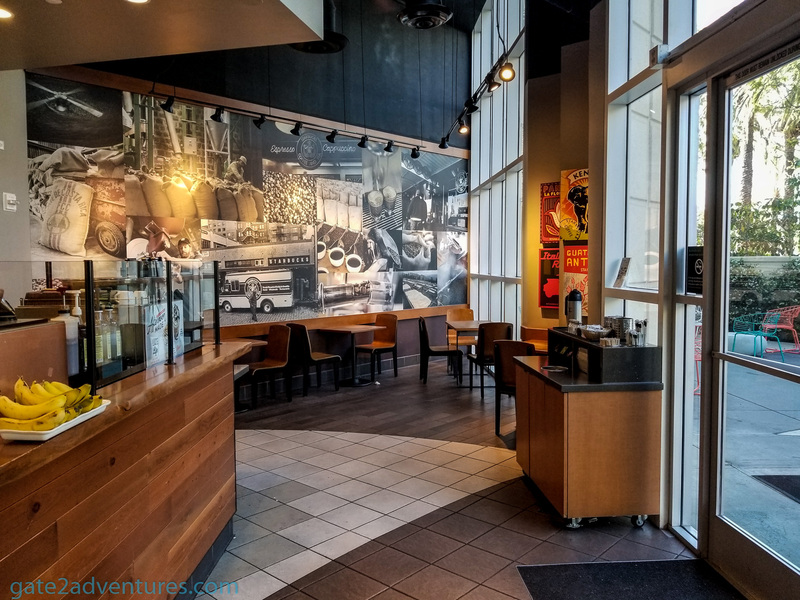 Use the doors near the hotel’s Starbucks to get to it. The half-circle shaped pool has lots of deck-chairs around it to lay down and relax. 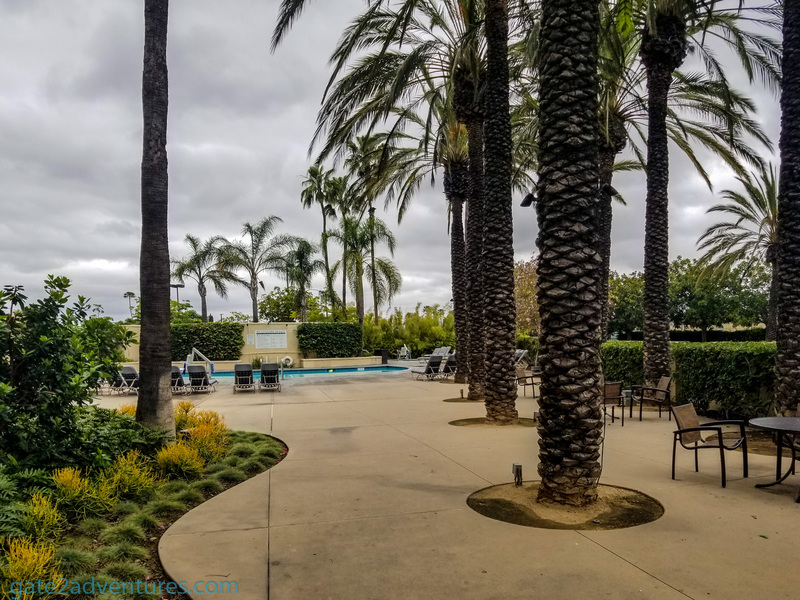 There are a restroom, showers as well as some vending machines in the pool area. 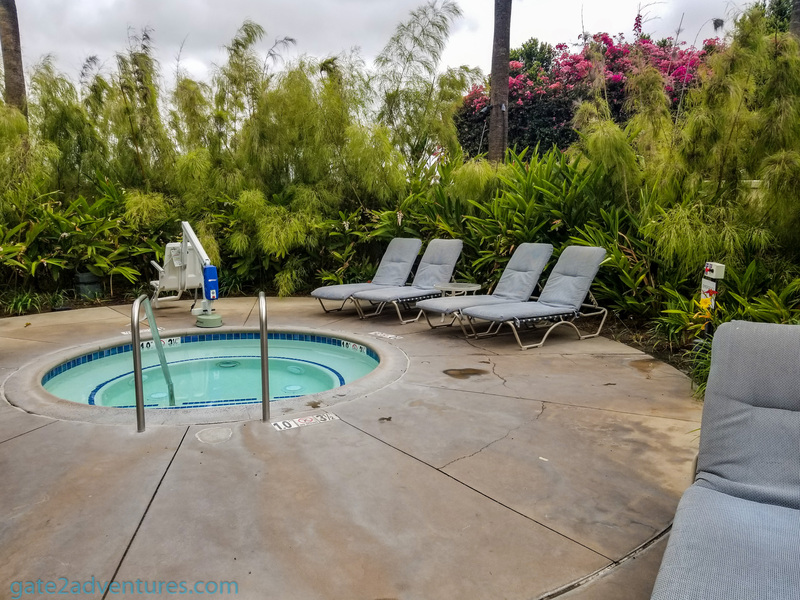 In the far left corner of the pool area is a small jacuzzi. 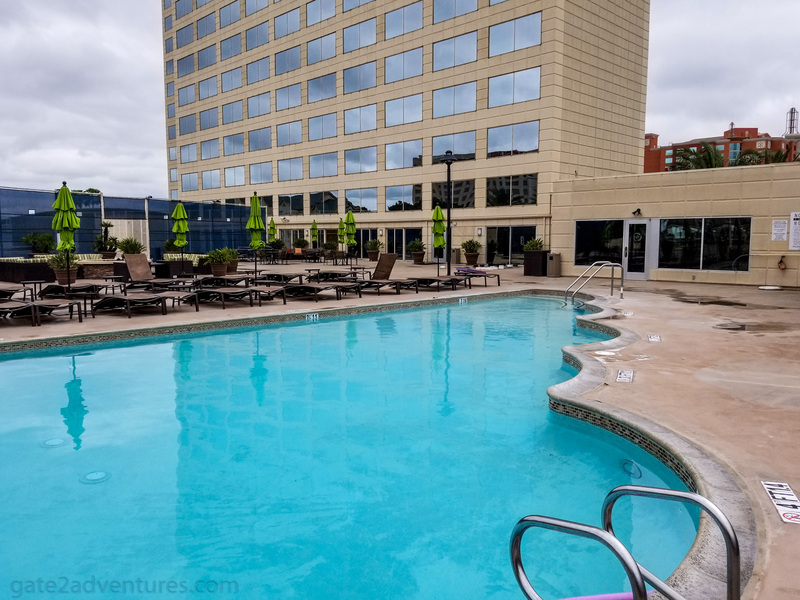 The second pool is located on the 3rd-floor Recreation Deck of the South Tower. 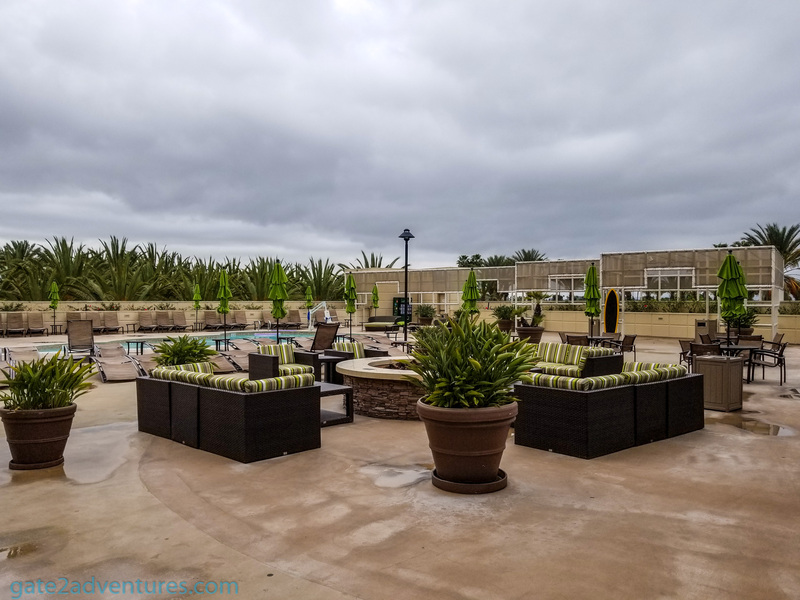 Besides the heated outdoor pool, you will find a Fire Pit, Basketball and Tennis Courts, oversized Checkers Game, ping pong table and bean bag toss. 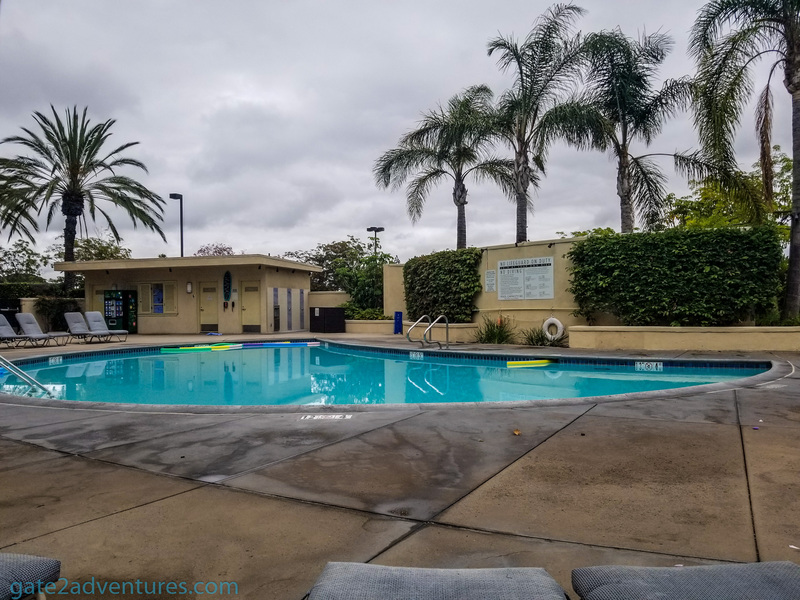 Perfect for the whole family to get active or just enjoy a relaxing time at the pool or fire pit at nights. From 6:30 a.m. until 10 p.m. you can order pool service delivery from the restaurant for both pools. Just use the phone located near the pools and the operator will connect you to place your order. 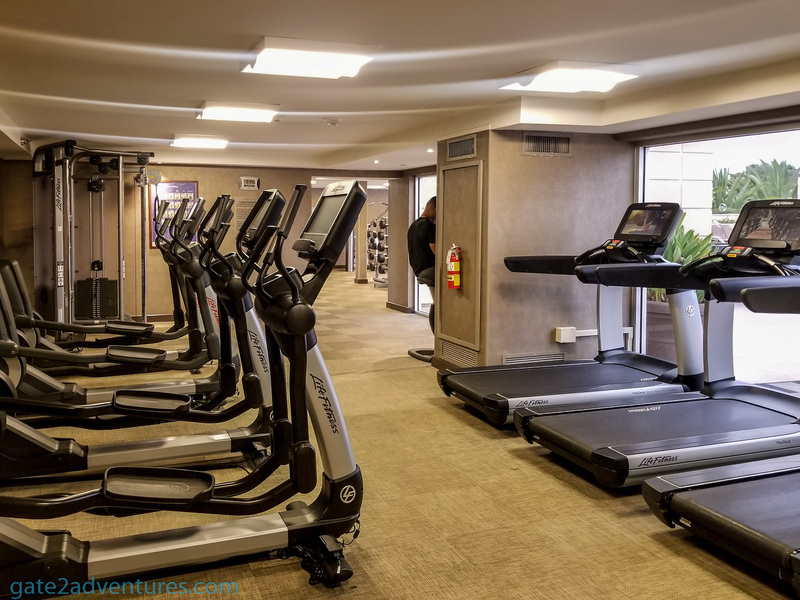 The Fitness Center is located on the same level and you will pass it on your way to the recreation deck. 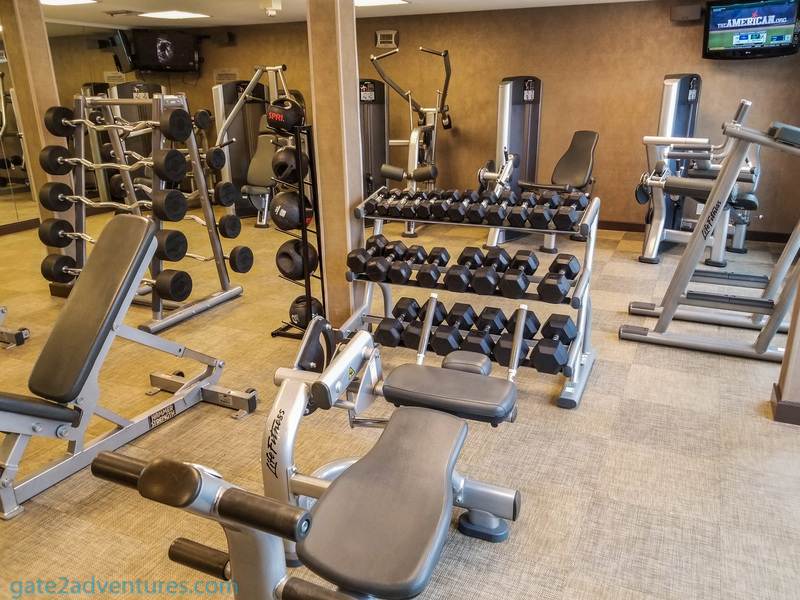 The fitness center has a big selection of equipment to train and stay fit and offers a view of the recreation deck. 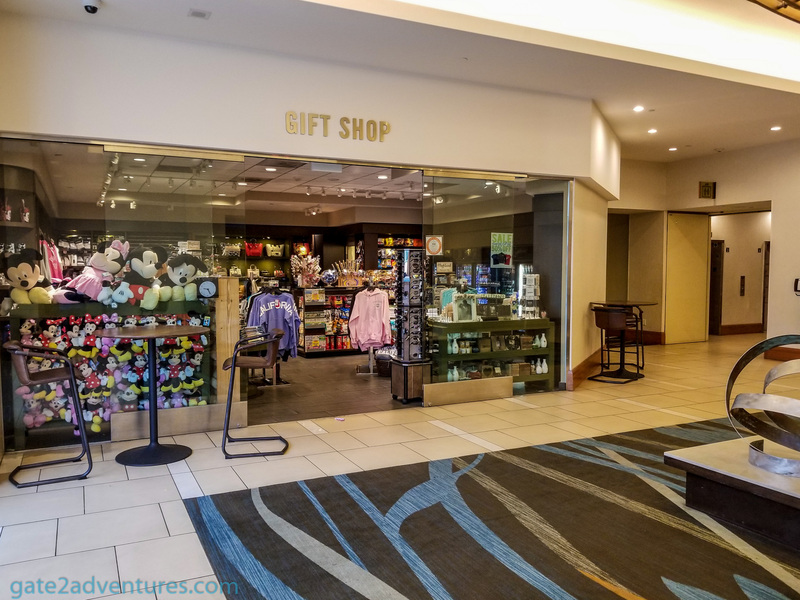 On the ground floor, you have a gift shop for last minute souvenirs to buy as well some other stuff like drinks and small snacks. 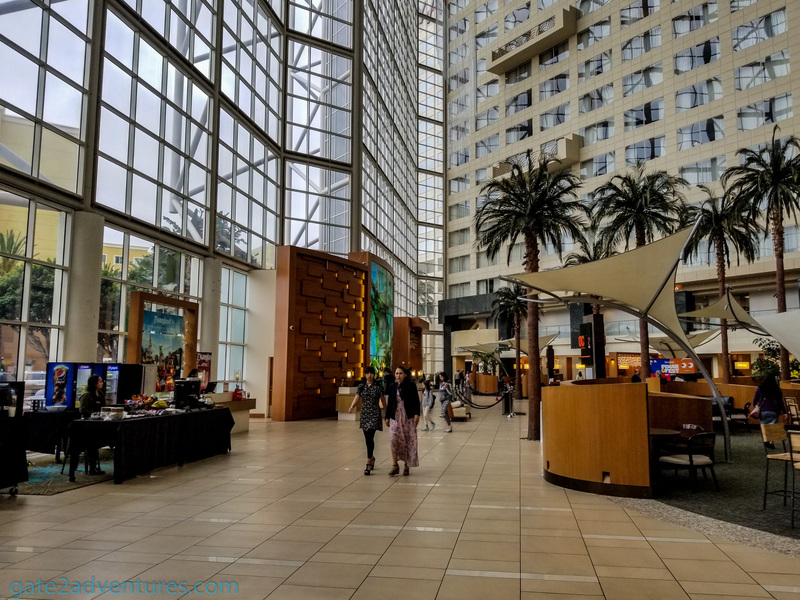 The huge lobby area offers its own dedicated Disney Service Desk, where you can buy tickets for the theme park, an ATM machine, ticket machine to buy tickets for the Disneyland Shuttle Bus, plenty of seating and much more. 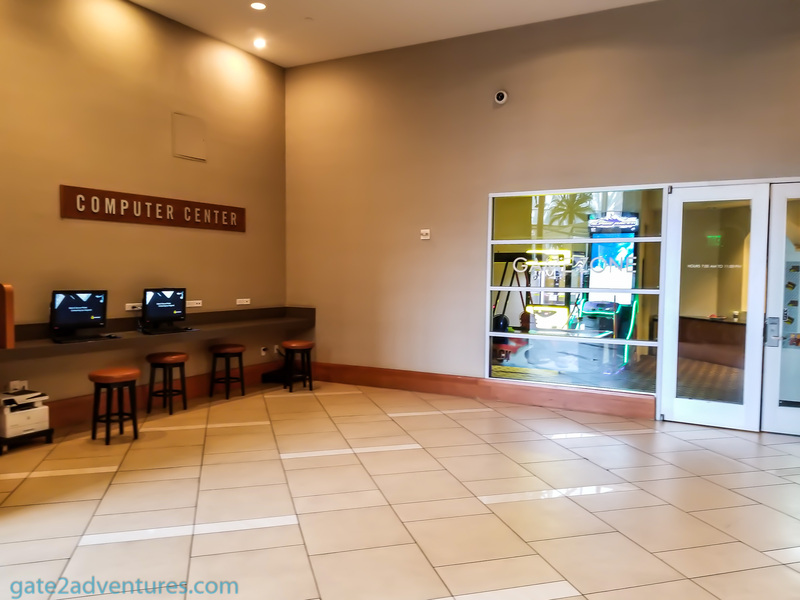 Next, to the central hallway leading to the Ballroom and back entrance of the hotel, you find the Computer Center with two workstations and a printer plus additional space to set up your own laptop. 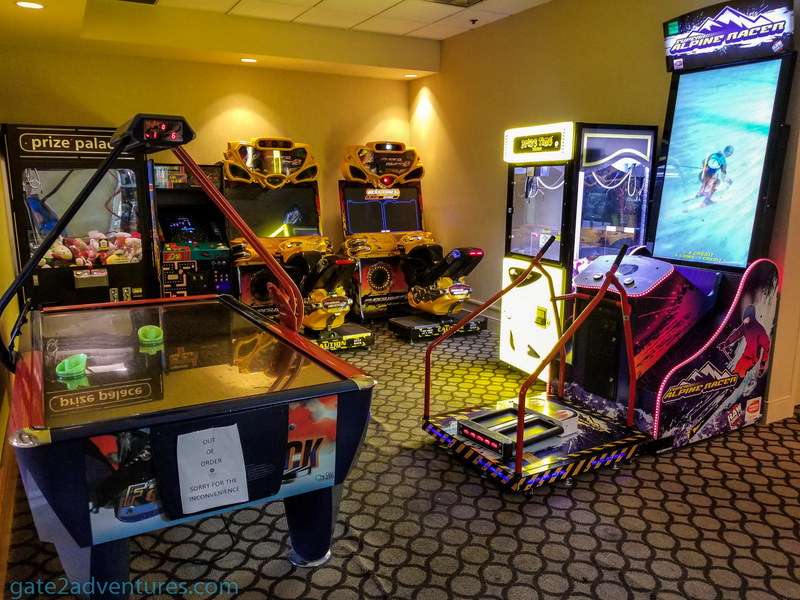 Next to it is the Game Zone (open daily from 7:00 a.m. until 11 p.m.) with arcade machines. Great to keep kids busy. The biggest downside for all of you Globalists is probably that there is no Regency Club at this hotel. 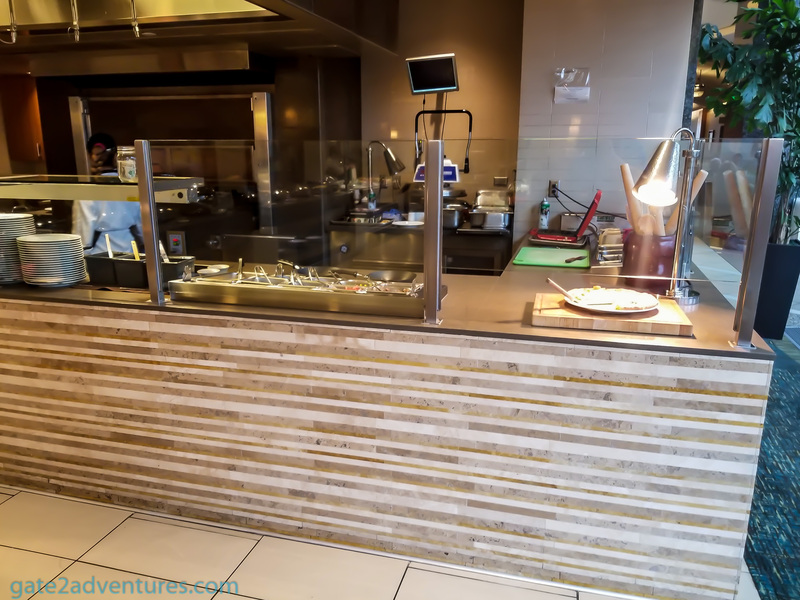 Instead, you will get a free complimentary breakfast at TusCA every morning including tips. TusCA is the way to go for a good breakfast here. 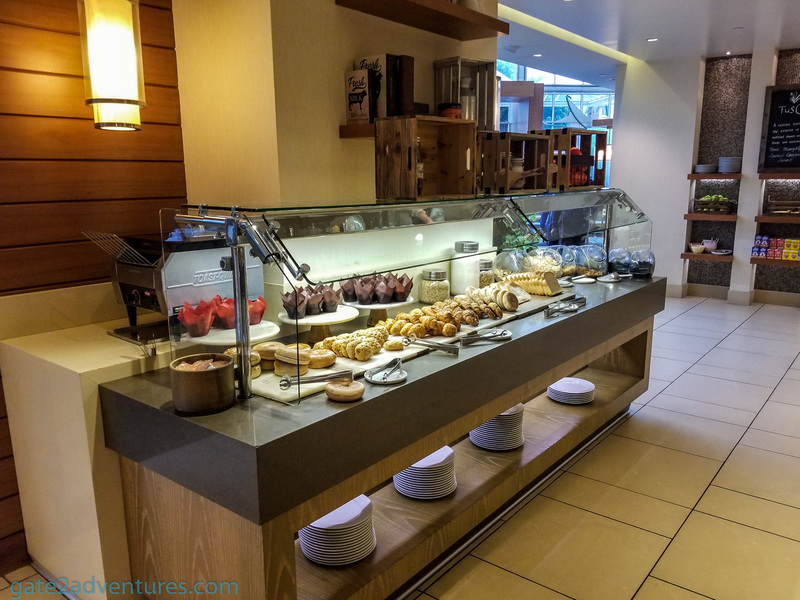 There is an a la carte menu or the breakfast buffet, which I preferred. 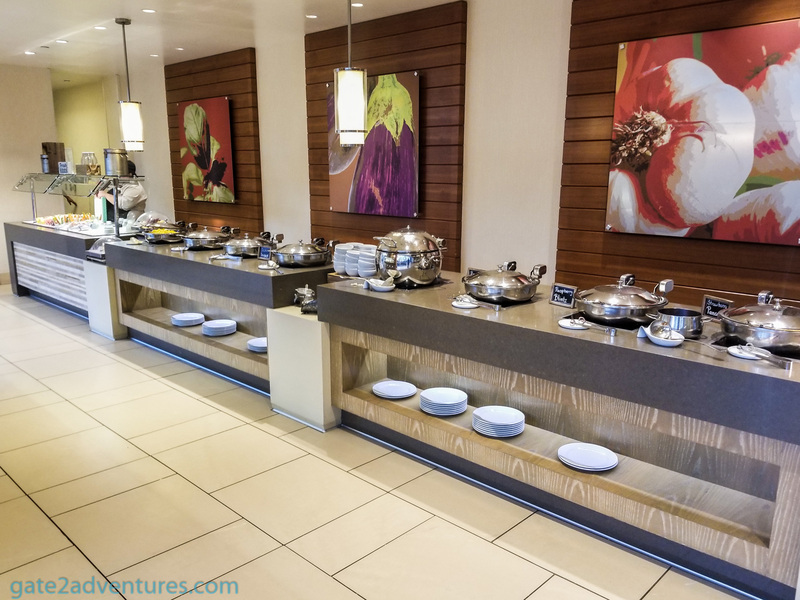 The buffet features also an omelet station, where you can order your omelets to your choice. 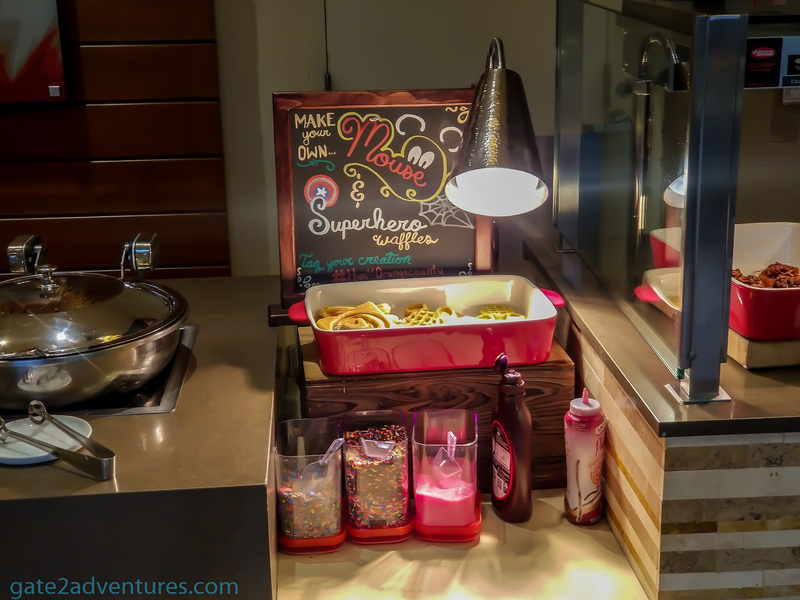 The buffet has offers basically everything you need and also caters towards kids. 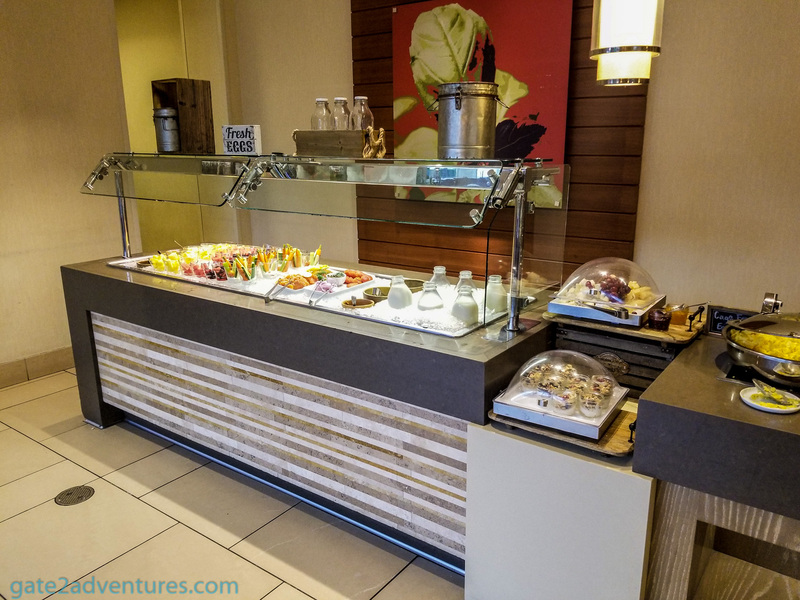 If you are to busy to sit down, there is an on-site Starbucks or choose something from the Citrus Grove Deli which serves items for breakfast, lunch and dinner and everything in between. 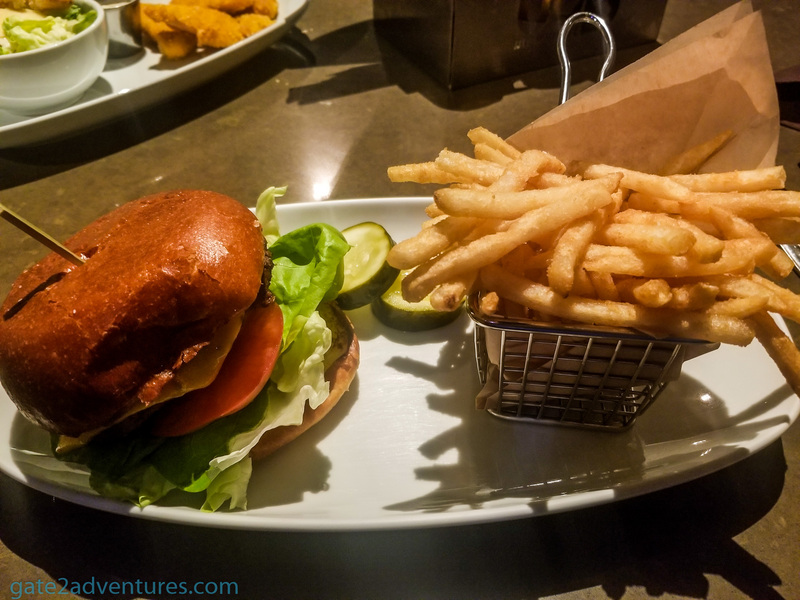 For lunch and dinner, you can go with the OC Brewhouse, which also offers take-out and delivery. If you are not too busy, go with take-out and you save the delivery charge for the food. 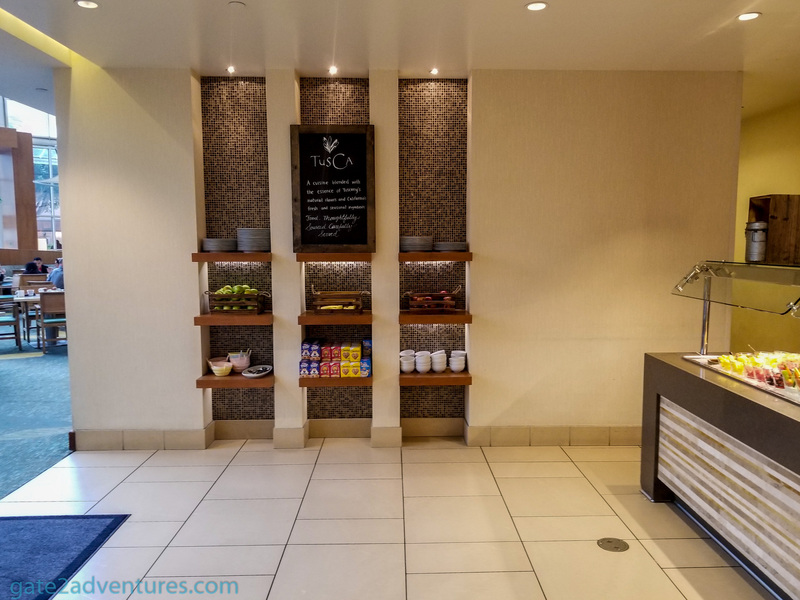 You can find a menu and more information in the in-room flyer. 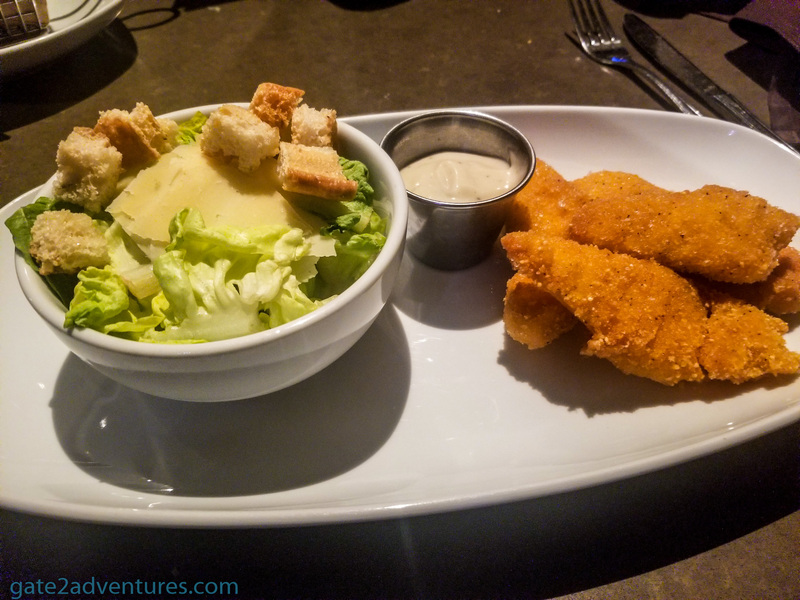 I had dinner at the Brewhouse and the food was good, but nothing over the top. Parents will be happy to hear that there is a movie corner with family-friendly movies. You can sit close by to enjoy your dinner and watch over your kids while they watch a movie. Service was pretty good as well. I recommend you to go out and explore the local food scene. There are plenty of restaurants in the area. Some of them even within walking distance, so you don’t have to worry about drinking and driving. For example, there is an Outback Steakhouse just across the street from the hotel. 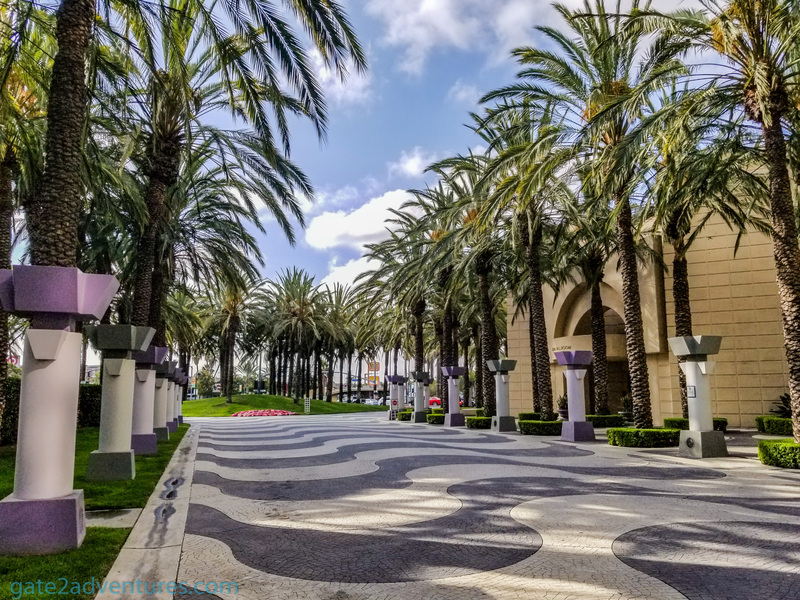 Another good location for food is the Anaheim Garden Walk. My stay here was great. The staff is super friendly and very communicative. They are pro-active to make sure you have everything you need. So please pay them the respect and courtesy they deserve. The only negative thing was a small hick-up with my take-out dinner order, but no big deal and as mentioned earlier, the elevators are a nightmare. 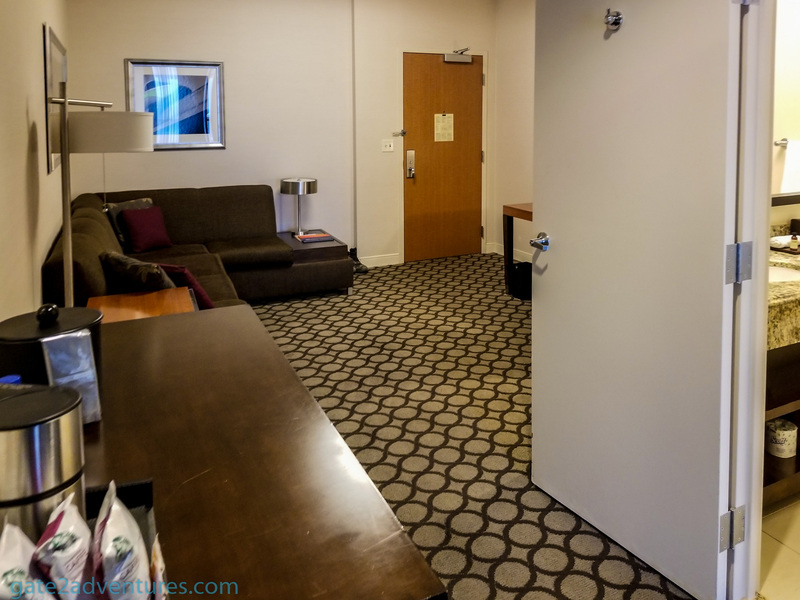 If you don’t care about views, try to get a room on a lower floor to use the stairs for the time being until the finish the elevator modernization. My room was very spacious and clean. You can’t go wrong with this place, especially if you are going to Disneyland. It seems that they have very decent rates for a hotel of this magnitude and service. 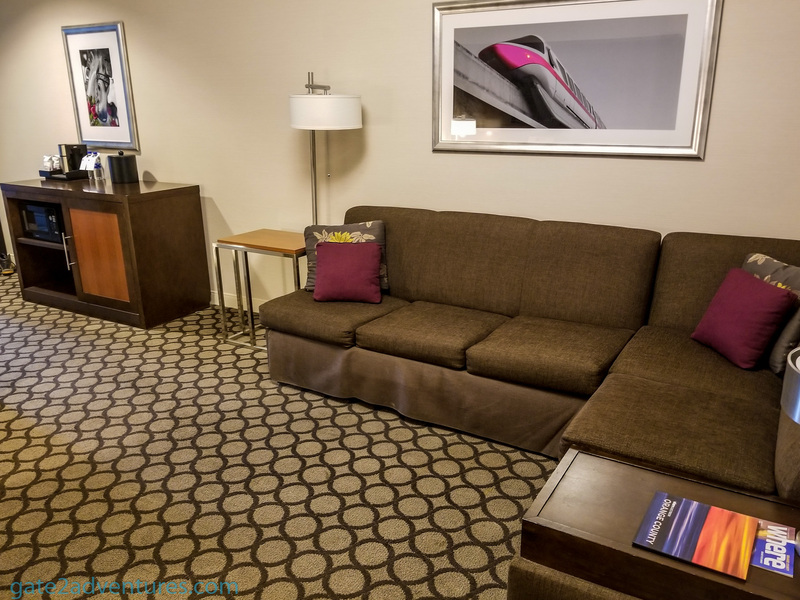 If you are a family with kids, check out one of their Kid’s or Family Suites. Monday – Friday 6:30 a.m. – 11:30 a.m.
Saturday & Sunday 6:30 a.m. – 12 p.m. 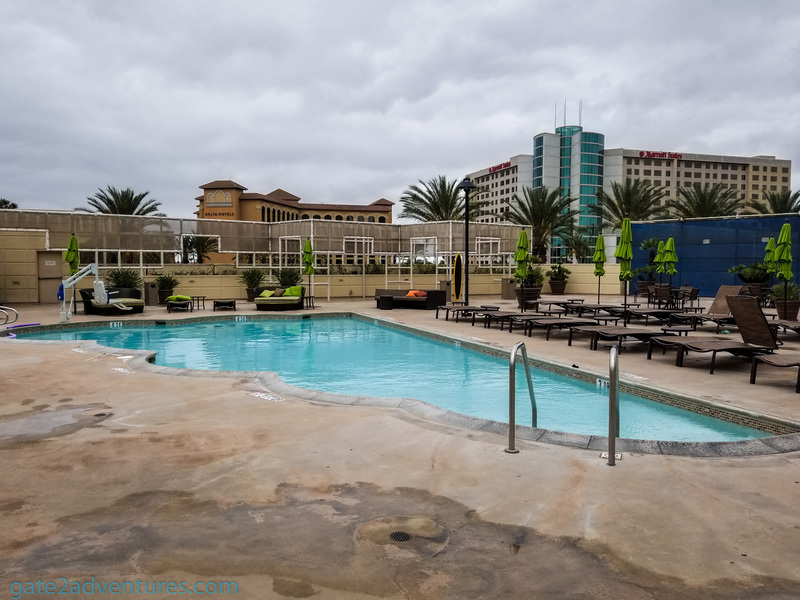 Pool: Daily from 6 a.m. – 10 p.m.